It is great to this painted tile of William Mahoney. I have been wearing his bracelet I bought after 9/11 and have a 8×10 picture of him on my office wall. 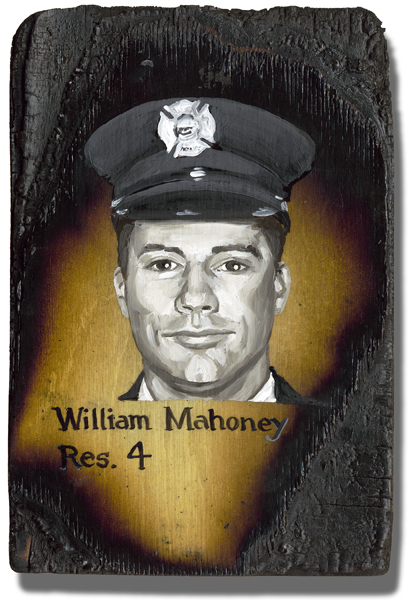 I have many people ask who is that up there, and I tell them that is William Mahoney who lost his life on 9/11 in NYC. They take a long hard look at his picture and most say Thank you. I was honored to see this tile of him, I never met him but I still pay respect to him everyday. I had the opportunity to participate in Operation Patriot for the 343 fallen Firefighters lost in the 9/11 attacks. I sponsored a flag that flew in the Healing Garden in New York over the weekend to honor our lost protectors. I was excited to receive that flag today and as I ripped it open to experience the Hand of God in that package, I felt tremors run through my hands and up my arms. Tears sprang to my eyes as I tightly hugged that beautiful flag with Firefighter William Mahoney’s name tag on it. I was awash in the tragedy and the loss, the sadness and the pain, for his loved ones left behind, for all of us who mourn. I was reminded of his love for all mankind as he served without hesitation to care for and protect so many on that horrible day in 2001. I just want to say Thank You to William and to all of our fallen brothers and sisters. Your heroic leadership encourages us all to be the best Americans we can be, and for your service, for your precious life, we are forever, eternally grateful. The Heavens reflect your beauty and the streets are blessed in your presence. Rest assured, we will never forget!